The Carolina Hurricanes are surging towards a spot in the NHL playoffs. They played what felt like a playoff game Tuesday night at home against the Pittsburgh Penguins, an intense hard-fought battle. The Hurricanes and Penguins, each refused to bend, like boxers trading blows. When the Pens took the lead and seemed destined to emerge the victor, Justin Williams once again found the back of the net. He is doing what captains do, rising to the occasion with his leadership, and it is helping his team stay relevant in the playoff chase. Williams has had a storied career. Everyone remembers his Game 7 heroics in 2006, sealing his team’s Stanley Cup victory. Being heroic has characterized Williams’ career, and he has earned the nickname, “Mr. Game 7″ for good reason. I don’t have any doubts what Justin is going to bring. He’s going to bring his all, and his all is pretty good. I think he has the same approach every game. He’s a real competitive guy, so when you’re that competitive and you’re that prepared, I think stuff works its way out and goes your way over time. Williams has won the Cup three times. Once with the Hurricanes in 2006 and twice with the Los Angeles Kings in 2012 and 2014. In 2014, he won the Conn Smythe Trophy as the playoff MVP. Williams’ experience combined with his competitive spirit is exactly why he is the captain of the Hurricanes. Even though the team’s former head coach Bill Peters did not see the value in naming Williams captain, Rod Brind’Amour wasted no time in putting the “C” where it belongs at the start of this season – stitched boldly on the sweater of number 14. Sure, lots of players score goals at significant times but the captain of this team is doing his best to leave everything on the ice and inspire his teammates to do the same. With 10 regular season games left, Williams is making sure that if the team does not make the playoffs, it won’t be for lack of effort. Everyone may want to be the guy, but it takes a special makeup to actually be the guy and to become “Mr. Game 7”. Williams has earned that gloss and is still making big plays in clutch situations. He’s the captain because he is doing what captains do and has been doing so his entire career. 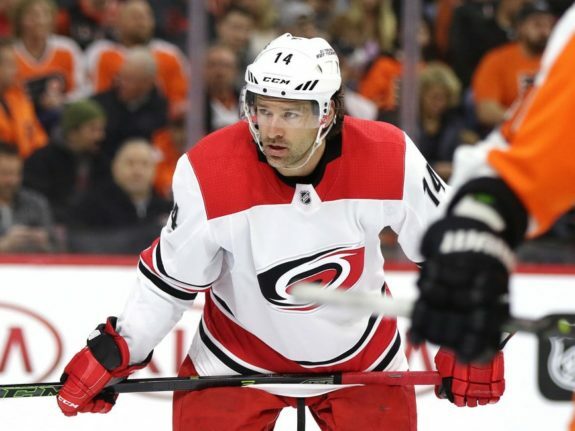 When the Hurricanes make the playoffs sometime in the next week or so, it will be due to a combination of factors: scoring, goaltending, defense and “the guy” being “the guy” just doing what captains do, leading by example and helping his team win.